Max-Q in een notebook van slechts 17 mm dik. 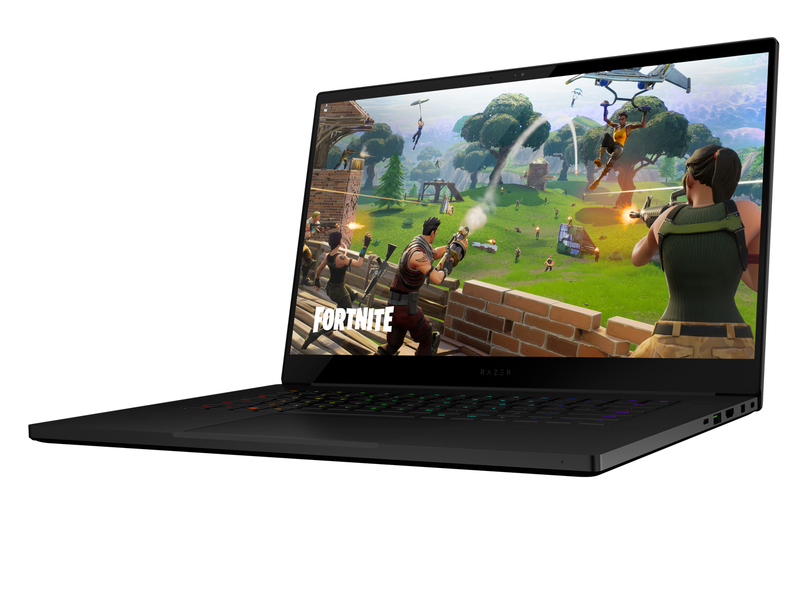 Alleen het beste voor de Razer Blade 15 (2018): het is niet genoeg om de dunste game notebook op de markt te zijn, er moet ook een 4K beeldscherm in de 14-inch behuizing gezet worden. Een geval van een Ultrabook met een Max-Q GPU en hexa-core Coffee Lake processor? De Blade 15 is een goed verzorgde laptop. Hij zit stevig in elkaar en is voorzien van de nieuwste hardware, maar er is ook nagedacht over de nieuwste aansluitingen, zoals hdmi 2.0b en displayport 1.4. De hardware is snel, maar de koeling kan aardig wat herrie maken en het toetsenbord heeft weinig travel. De prijs is hoog, maar je krijgt er ook wel een erg goede laptop met een snel 144Hz-scherm voor terug. De accuduur is voor een gamelaptop lekker lang en bedraagt acht en een half uur tijdens browsen. Essentially by accident, Razer has created an exciting substitute for the usual mobile workstation fare. Though its graphics processor and hexa-core CPU were intended to run games, these components can be harnessed for productivity too – and for much less cash than a high-spec MacBook Pro. The Razer Blade 15 is a fully capable laptop with a certain style that wouldn't look out of place in the office, while offering the power and punch to deliver superb gaming results on the go or at home. If cost doesn't put you off, this is certainly a gaming laptop to consider. The base model of the Razer Blade offers a premium design, solid gaming performance and over 6 hours of battery life. Razer might have stripped away everything I enjoyed most about the original Blade 15, but they didn’t take away its ability to play games on high settings at desirable frame rates. I’d wait for another manufacturer to attempt what Razer hasn’t quite done here... and hopefully do it better. Claiming to be the "smallest 15-inch gaming laptop," the redesigned Razer Blade 15 likely makes good on that promise by being pretty small and fairly light, while offering blistering gaming performance. While gaming laptops are typically all measured on gaming performance and nothing else, the Razer Blade 15's selling point is being the "smallest 15-inch gaming laptop" in town. On that point, we'd have to agree. The Razer Blade 15 is the latest entry into Razer’s flagship line of gaming notebooks. It targets the same space as the stellar Gigabyte Aero 15, aiming to offer buyers a thin and light gaming laptop that doesn’t skimp on specs. The Razer Blade 15 masterfully balances performance and portability. The Razer Blade 15 is pretty expensive, especially if you want a 144Hz model, but not more than rival gaming laptops and you’re getting a serious combination of design and specs here. But if you want to splurge on the "classic" model, which is thinner, has better GPU and screen options, per-key lighting and a better battery, there's also a new version of that. The hardware is the same, but Razer is now offering the Blade 15 in a Mercury White color, which is a welcome break from all that black and green. Those issues do get in the way of what is otherwise a premium, very well built machine. Gaming performance is excellent, too, but the reality is you will only be able to fit 3-4 games on the laptop at any one time, while those planning to run CPU-heavy tasks will also experience slow down. The Razer Blade 15 delivers absolutely everything we want in a gaming laptop, in one of the best-designed bodies we’ve ever seen. The build quality is top-notch, and gaming performance matches. The downside, of course, is its price. The Blade 15 that’s for a GTX 1060 Max-Q GPU and a 60Hz screen. The GTX 1070 Max-Q models, like the one we tested here, with more expensive options if you want a larger SSD or a 4K panel. I think the Razer Blade 2018 is only a few tweaks away from becoming the standout gaming laptop option on the market, so I have high hopes for the next generation. But right now it’s so close, yet so far from being the best gaming laptop and its competitors are just too strong to ignore. This ultra-portable has enough power to make your games console jealous, but it can also get unbearably hot. The Razer Blade 15 masterfully balances performance and portability. The redesigned device has all the trimmings of a great mobile gaming station and feels like a significant step forward on Razer’s previous offering. Make no mistake: if portability is your primary concern then this is one of the best gaming notebooks currently available. The Razer Blade isn't meant for everyone. Those who can afford it can look forward to being the envy of gamers and non-gamers alike. And you get what you pay for: a machine that will play everything and look good while doing so. It’s a great machine, though. Peerless, when it comes to the actual design itself. It’s a real pleasure to use the Blade Stealth, be it on a plane or just at home lounging on the couch. Durable enough to feel rugged and portable, but lightweight enough to make it worth carrying, I really love it. Despite its compromises, my overall feelings for the Razer Blade 15 are positive. It’s not the perfect computer but it comes close. It checks off just about every box I have for a computer and does so in impressive fashion. There are some compromises, like the poor speakers, and I have my bones to pick about the 144Hz display not being available in 4K, but the overall quality of the computer makes up for it. The 2018 Razer Blade is Razer's most refined laptop yet. It's not revolutionary, and lacks any particularly novel features such as a second screen, but that may just be what makes it so good. This seems especially significant, given that the very first Razer Blade that the company announced in 2012 featured a trackpad that doubled as a secondary display and 10 additional buttons with customizable icons. The new Razer Blade offers some exciting updates like GTX 1070 graphics and a bigger display, all while keeping the thin form factor and top-notch build quality. Bottom line: performance purists who wish to extract every last ounce should look elsewhere, but if you're looking for a potent PC that's as pretty as it is powerful, Blade 15 is the smallest and sleekest gaming laptop in its class. The Razer Blade 15's sleek new look is refreshing, and the laptop offers long battery life. But the display could be brighter, and the keyboard isn't comfortable. The Razer Stealth 2018 ticks most of our boxes for a modern premium laptop. It’s sleekly designed, doesn’t waste any space, and is packing exactly the kind of hardware we’d hope to see in a laptop in 2018 (sorry, AMD). The Razer Blade 15 is pretty expensive, especially if you want a 144Hz model, but you’re getting a serious combination of design and specs here. Razer has announced a brand new version of its Blade laptop for 2018, complete with a fresh look and even more compact design than before. All the hardware does weigh a bit more, though. The new Razer Blade with the FHD screen will weigh about 4.56 pounds (vs. the older version's 4.10 pounds). The 4K touch version will push the weight up to 4.73 pounds (vs. the older Razer Blade's 4.25 pounds). NVIDIA GeForce GTX 1070 Max-Q: Deze grafische kaarten zouden de meeste moderne spellen op een hoge resolutie en hoge details moeten kunnen draaien (enkele uitzonderingen zijn mogelijk). 2.056 kg: Gewoonlijk hebben subnotebooks, ultrabooks en redelijk lichte laptops met een 12-16 inch schermdiagonaal dit gewicht. 81.91%: Deze score moet gezien worden als gemiddeld, omdat het aantal notebooks dat hoger scoort ongeveer gelijk is aan het aantal dat lager scoort.